Some of us have tricks for remembering things — association triggers, for example, to help remember people’s names, favorite books, or answers to possible questions on tests. I have developed tricks for remembering recipes. 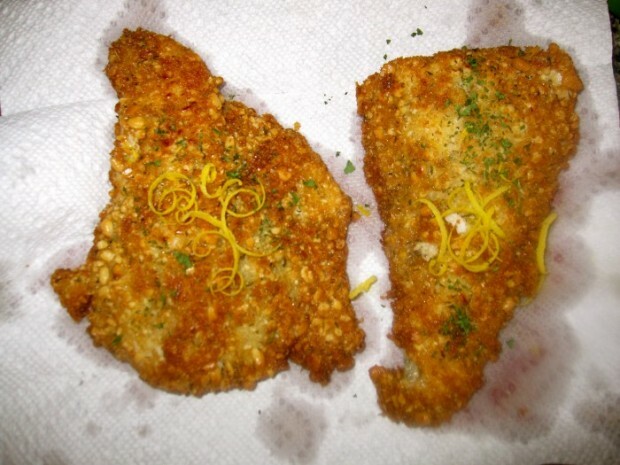 For example, when I’m craving pan-fried fish or chicken fillets, comfort foods that satisfy in the midst of winter doldrums, I think of the abbreviation for the month of February: FEB. For me that stands for Flour, Egg and Breadcrumbs, and I follow that dredging order before frying to make exceptional crispy fillets without using a recipe. I often fiddle around with this basic formula, adding buttermilk to the eggs, for instance, when making chicken breast fillets, or adding nuts to the breadcrumbs (as in the recipe below) for an additional flavor and textural component to chicken and fish. You can have a great fun with seasoning rubs — think Cajun or curry blends — to complement your selected side dishes. Walleye is a wonderful fish for frying, and walnuts or pecans would have been fine substitutes for the pine nuts in the following recipe. Dry or fresh challah breadcrumbs would work well too, but I generally use panko (Japanese breadcrumbs) for extra crispy results. When frying, careful attention must be paid to the burner heat. The fillets should sizzle, but not wildly so, or the exterior will be fried to golden perfection — worse, burned — before the interior is fully cooked. Certainly don’t ever, ever cook when the oil is smoking. On the other hand, if the oil is not hot enough, the crust will not crisp properly and possibly fall off in the pan. The thickness of fillets determines cooking time; the fatter the fillet, the longer it needs to cook; adjust your heat accordingly, and use a lower flame. Before frying, place a bit of nut batter into the oil; if it sizzles without quickly burning, the oil should be ready for the fillets. It only takes 7-9 minutes to fry these boneless pieces, so it’s not a big deal to monitor the heat by turning it up or down as needed; the results are well worth the effort. The nutty-lemony crust is absolutely delicious, complementing the mild sweet flavor of the white-fleshed walleye. But if trying to cut calories, it’s easy to detach the skin at the table; the crust even serves as a barrier from letting the cooking fat seep into the flesh. You can bake the fillets (to cut fat) in a similar fashion as well; Preheat the oven to 375 degrees, season the fillets with salt, pepper, olive oil and lemon juice, omit the egg wash and flour, press the panko-nut-thyme mixture into the flesh, then bake until flesh is white and flakes when pricked with a fork, 17 to 21 minutes. This method is quite good but nothing, to my palate, compares with the (I’ll repent tomorrow) pan-fried version. About that pan. For fish, I don’t use my treasured cast iron skillet, as it is reserved for chicken and beef. One of these days I’ll invest in a cast-iron skillet to be used exclusively for fish, but until then, my heavy-bottomed, 12-inch Calphalon skillet has worked like a champ. The Lenten season began last week and according to Wikipedia, Lent is the Christian observation of the liturgical season from Ash Wednesday to Holy Thursday, followed by Good Friday and Easter. Many of the faithful give up luxuries as a form of penitence during this period; giving up meat on Fridays, often substituting with fish. If you’re a daily meat eater observing Lenten traditions, you’ll find the following recipe might lessen the pain. Pulse nuts in a food processor; do not puree. Combine nuts with panko and thyme. Place enough oil in the bottom of a heavy-bottomed skillet to rise 1/3 inch. Heat to medium-high heat. Liberally season both sides of walleye with kosher salt and freshly ground pepper. Place flour, egg and nut mixture in shallow dishes large enough to accommodate fillets. 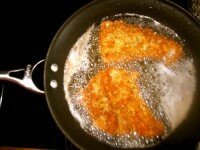 Dip fillets in flour, then egg, then coat in panko-nut mixture, pressing to adhere to fillet. Oil is ready for frying when a piece of nut mixture sizzles but does not burn in pan (350 degrees); oil should never be smoking. Place fish in hot oil and fry, 3-5 minutes per side, or until golden brown on each side. Monitor heat between medium and medium high heat so fish is crispy but doesn’t burn before it’s cooked through. Garnish with fresh squeezed lemon juice and lemon zest.